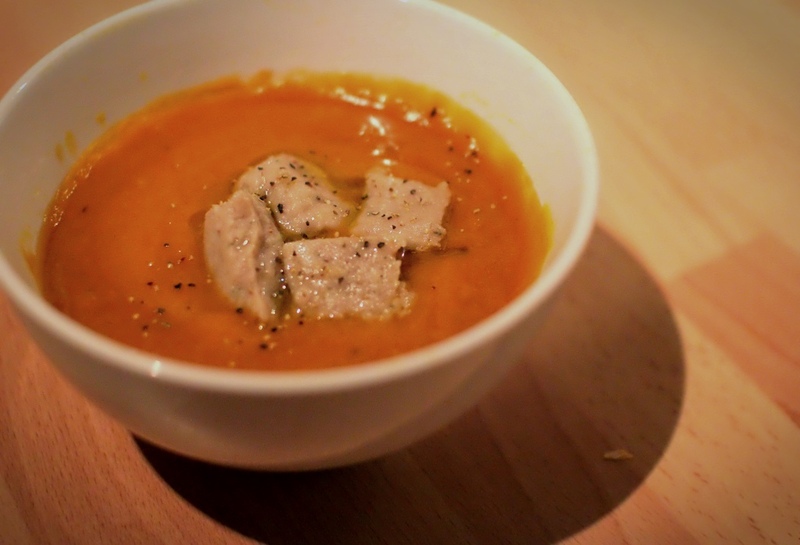 Fantastic variations on a roast autumn/winter soup! The idea behind this post is a basic soup recipe that you can add to, to suit your tastes, dietary needs and the social occasion. It is delicious, hearty and very healthy. Kids seem to like it too. Serves approx 4. Preheat the oven to 190 degrees/gas mark 5. Put a roughly chopped onion plus a peeled chopped vegetable/vegetables of your choice in a roasting tin (try butternut squash, carrot, parsnip, sweet potato, celeriac or beetroot). Add two crushed garlic cloves, a few sprigs of thyme and some olive oil. Cook until the veg are slightly caramelized but not burnt, turning them a few times. Blend the roasted mixture along with veg stock (approx 2 stock cubes in hot water) until the right consistency. If you want extra texture, only blend 3/4 of the soup. Add a tin of butter beans after the basic recipe has been blended. Gives extra texture too. After blending and before serving, add some finely chopped fresh herbs such as parsley or coriander. 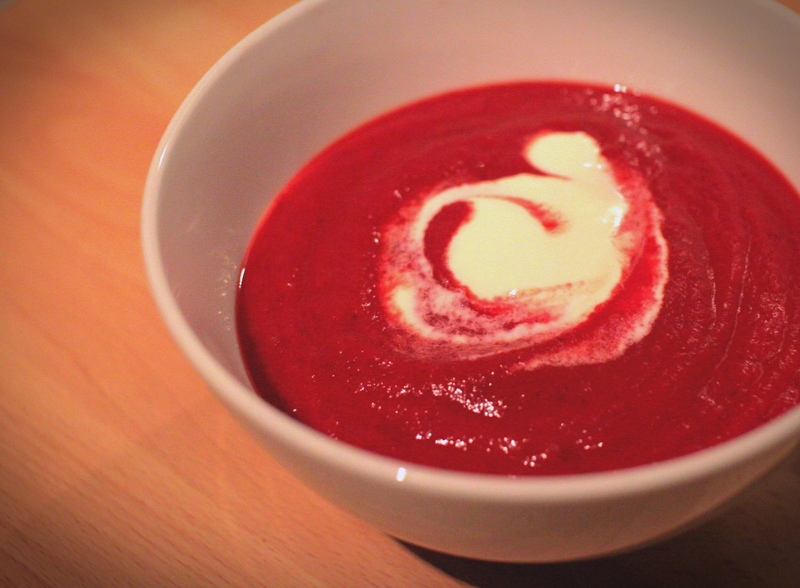 When serving, swirl some double cream or creme fraiche in to the soup. Top with surprisingly simple to make sage and chestnut gnocchi (recipe below). Top the soup with garlic ciabatta croutons. See recipe below. Don’t forget a drizzle of olive oil to finish off all the above toppings. Hope the soup warms up your autumn/winter! Please let me know if you have any further suggestions. Gnocchi are little dumplings that are a staple in the Italian diet. I am very excited to have made them for the first time and discover how quick it is (about 15 mins once you have baked the potato). I think it takes practice but it turned out well and tasted lovely. The gnocchi can also be a meal in their own right – just add some blue cheese/goats cheese, rocket and olive oil. Preheat the oven to 180 degrees/gas mark 4. Bake the potato for one hour until soft, scoop out the flesh and pass through a sieve or potato ricer in to a bowl (I didn’t do this – they still worked but may have been better had I done). Add the flour, parmesan and nutmeg and mix. Stir through the egg, chestnut puree and sage. Alternatively chuck it all in a blender! Lightly flour a work surface and, with your hands, roll out the dough to form a sausage about 1.5cm in diameter, cut in to 2.5cm pieces. Gently roll, then press with the back of a fork to create ridges (I forgot to do this and wish I hadn’t!). Bring a large pan of salted water to the boil, add half the gnocchi and simmer for 1-2 minutes, until the gnocchi float to the top. Remove the cooked gnocchi and transfer to a bowl of cool water. Repeat with the remaining uncooked gnocchi. Remove from the water and set aside to dry on a tray covered with a clean tea towel. If you wish you can then dust the gnocchi with a little flour and fry for a couple of minutes until starting to colour, but it is not essential. Top each bowl of soup with a few gnocchi and serve. Note: You can freeze gnocchi once you have cut them in to pieces, as long as you keep them seperated. You will know when they have cooked as they will rise to the top of the water in the saucepan. These croutons compliment soup by giving crunch and extra flavour. The croutons also work well in salads. Yum. Preheat the oven to 220 degrees/gas mark 7. Rip the ciabatta loaf in to small or large chunks and put in a roasting tin. Add olive oil, garlic, salt and pepper and mix it all up. Cook until crisp and golden, approx 15 – 20 mins. Add croutons to each bowl of soup and serve, or put them in a seperate bowl for people to help themselves.